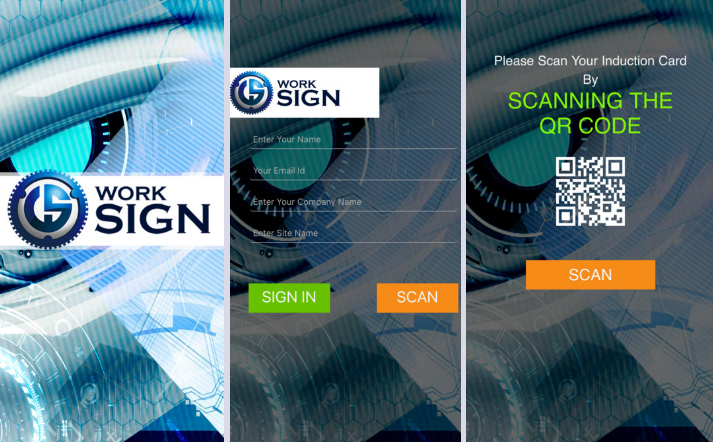 Available on both the Apple app store and Google Play, download the WorkSign app for visitor/contractor sign in and sign out on site for the most modern technology in visitor management and sign in on site. GPS location stamp visitors and contractors as they arrive on site. Using the app you can sign visitors and contractors in and out of site as they arrive to track who is currently on site right now, when did staff and visitors arrive on site, how long they spent on site, GPS track which sites they were at and much more. Ensure an induction has been down before they arrive on site, collect next of kin information, emergency details, acknowledge policies and procedures and complete an induction. The Work Sign app is perfect for signing in contractors on site. Get them through a short contractor induction, understanding emergency procedures, enter in next of kin and emergency contact details, capture their photo and more. You can then view who is currently on site, historical sign in data, number of times in and out and other sign in metrics. Why use an App as a Site Sign in System? An app is a modern way to replace the old visitor sign in book. It builds a digital database of who has signed in on site, cross checked against compliance and induction training. Can you really afford to have staff on site who aren't inducted, have a poor safety record, have expired insurances or are a high risk unchecked worker? Using the Work Sign app, you can in real-time cross check all these areas upon sign in to ensure the person signing in, is in fact compliant and should be allowed on site. Set up a tablet in reception, wall mounted or on a stand or you can sign in staff, contractors and visitors directly off their mobile.